VW Bus, Donut Cake and a Super Fun Father-Daughter Dance! What made you choose LIUNA? In addition, our families grew up not too far from LIUNA Station – and looking back on our family history, we see that humble beginnings gave way to great ambitions. What was the most unique thing about your wedding? VW Bus – We rented a VW Bus from thelongweekend.ca for our special day – when it was parked in front of LIUNA Station, we took some pretty awesome pictures in front and inside of the bus on the property – we were so happy! 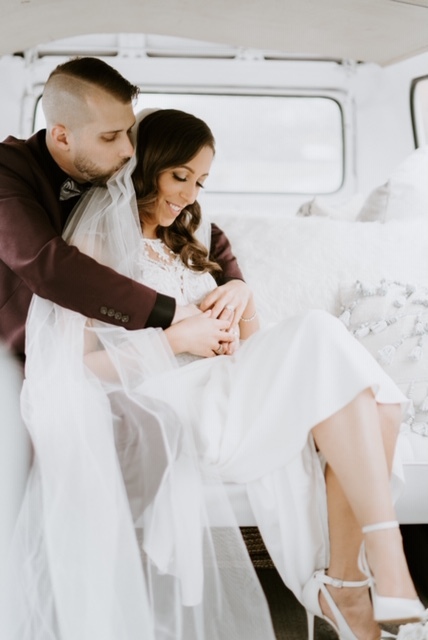 The bus gave the wedding pictures a unique vibe. Father-Daughter Dance – The father-daughter dance was so much fun! The song was ‘Ain’t No Mountain High Enough’ by Tammi Terrel and Marvin Gaye – the dance showed off the Bride’s and Bride’s Father’s fast dance moves. We received so many compliments on this fun and unique dance. 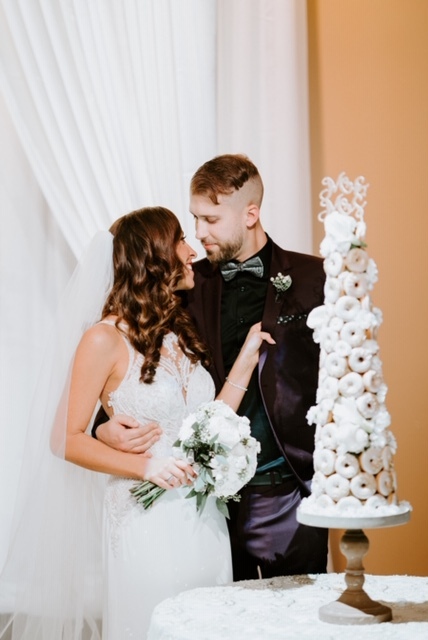 Our favourite season is autumn, and we always wanted to get married in the fall – we were so excited that October 27th, 2018 was available at LIUNA Station. We wanted to our wedding to be an elegant and classy affair, with pieces of autumn décor throughout the historical venue. Our colour scheme was cream and gold with hints of burgundy and plum. Which ballroom did you use? What about it stood out to you? We used the LIUNA Station Grand Ballroom. The entrance to the Grand Ballroom – with the addition of the LOVE letters – was absolutely spectacular. We gushed over the existing décor of the room – the natural light, the space, the chandeliers and the high ceilings. Our favourite part of the day was saying “I DO” – and then celebrating our love with guests at the reception. 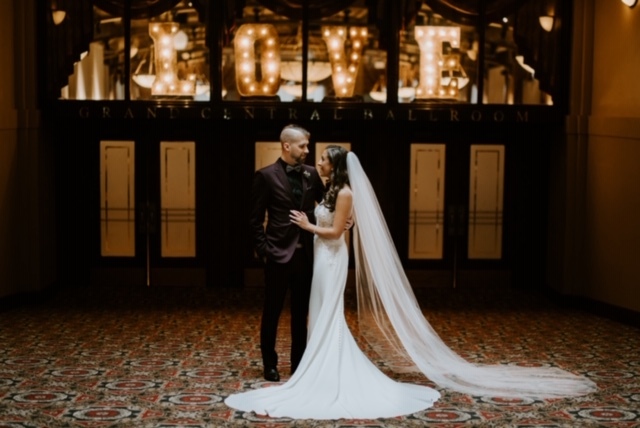 We loved when our guests arrived at LIUNA Station and they could enjoy the acoustic duet – Rosewood – in the front entrance as they waited in the receiving line. From there, our guests enjoyed the delicious antipasto buffet. Yum! We received so many compliments on the buffet and the food that day. What was your favourite part about working with LIUNA? The e-mail correspondence with the ladies in the LIUNA office was fantastic – the helpful and timely response made the planning process less stressful. The staff members at LIUNA were very accommodating – even at the last minute when changes needed to be made – nothing couldn’t be fixed or solved when working with staff. How were our onsite coordinators in helping you create your day and on the day of? The onsite coordinator – Patricia – was amazing! She made the day run so smoothly and she had every detail accounted for. Patricia made sure that our wedding day was the best day ever! We didn’t have to worry about a thing. Even when I dropped a tomato on my wedding dress – Patricia whipped out the pen and made the stain disappear! She saved the day! In three words, how would you describe the food?